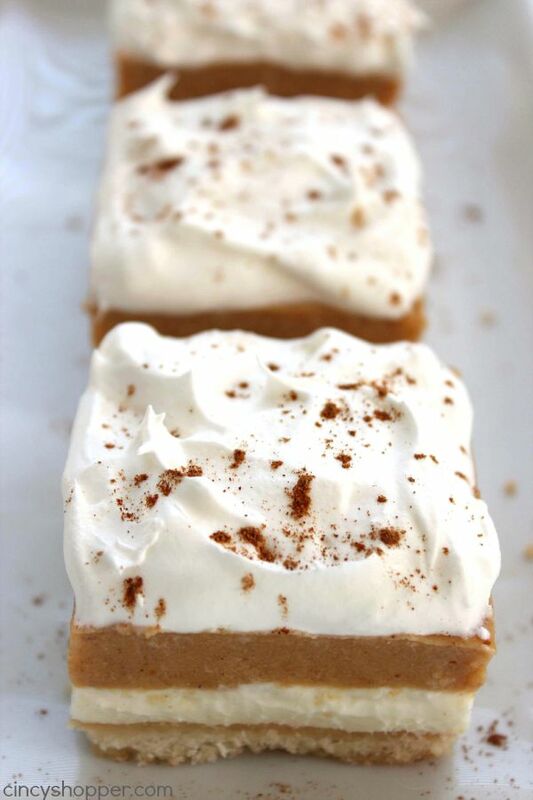 These Pumpkin Lush Bars will make for a delicious fall layered dessert. 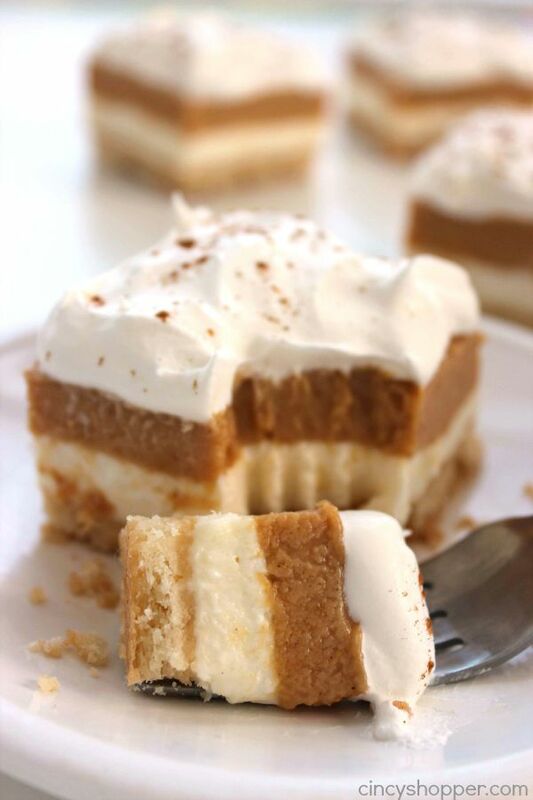 You will find layers of cream cheese filling, pumpkin pudding, and whipped topping, all on top of a yummy shortbread crust. Perfect for Thanksgiving dessert. 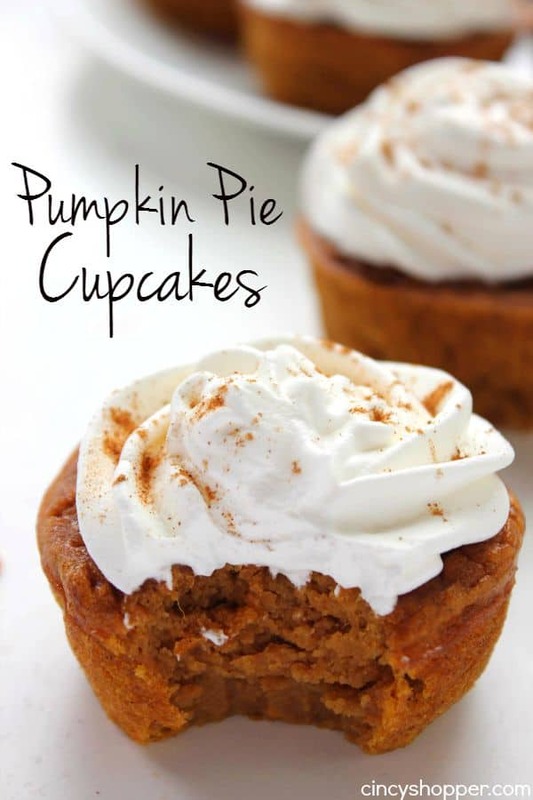 Fall has officially arrived and I have been sharing so many great pumpkin recipes with you these past couple of weeks. I made the most delicious homemade pumpkin pudding that was screaming to be used in a layered dessert. Since my family really enjoyed my Lemon Lush Bars this summer, I was thinking a pumpkin lush bar would be a perfect fall spin on the dessert. Oh boy was I right! These bars are like heaven. 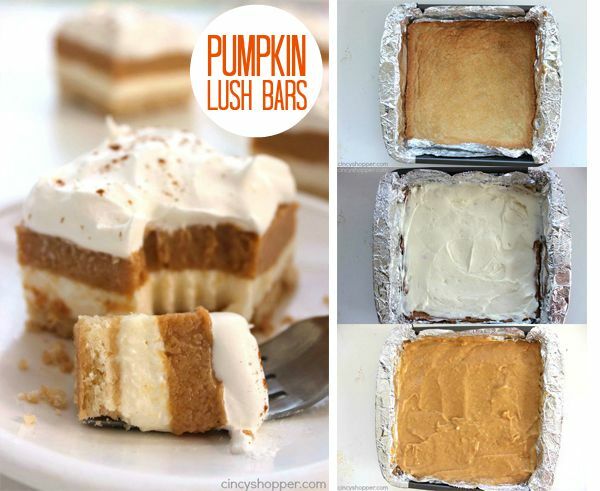 The flavors of pumpkin, cream cheese, whipped topping, and cookie base are out of this world amazing. My daughter and I enjoyed a piece after our light lunch today and we were both impressed. We both agree that they need to be added to our Thanksgiving dessert menu. Not only are these bars tasty, they are also super adorable and you could call them “elegant” looking too. They honestly remind me of a dessert you would find at a high end restaurant. 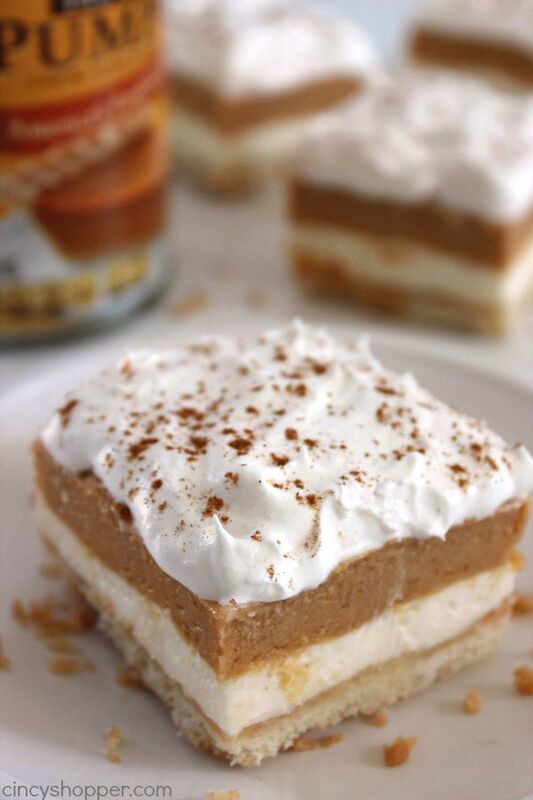 Since this is a chilled dessert, it will be a perfect make ahead holiday dessert idea. Not much baking to occupy oven space that is needed when doing holiday baking. 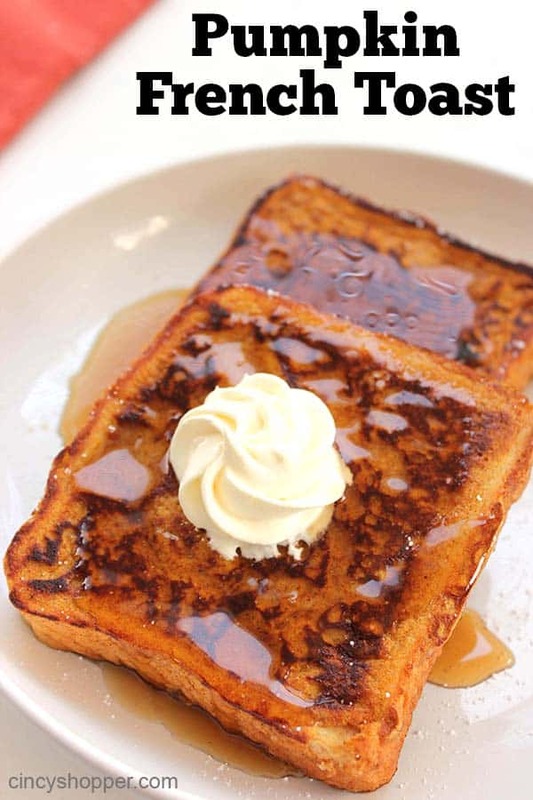 This recipe is so super simple and does not take very long to make. You can purchase store bought boxed pumpkin pudding if you find it in your local stores (it is a seasonal item). I used my own homemade pumpkin pudding recipe and it was perfect. Please note there is an egg in the ingredient picture that should not be there. 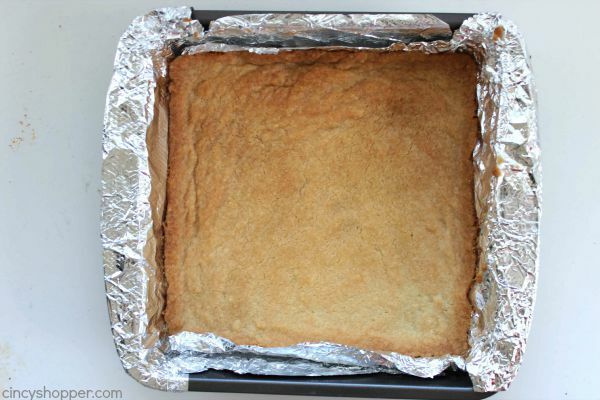 Line an 8×8″ dish with aluminum foil. 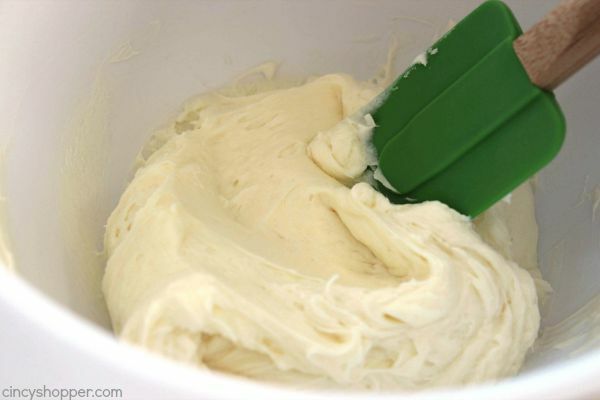 Cream the butter and 1/4 cup sugar until creamy. Beat in the flour until well blended. 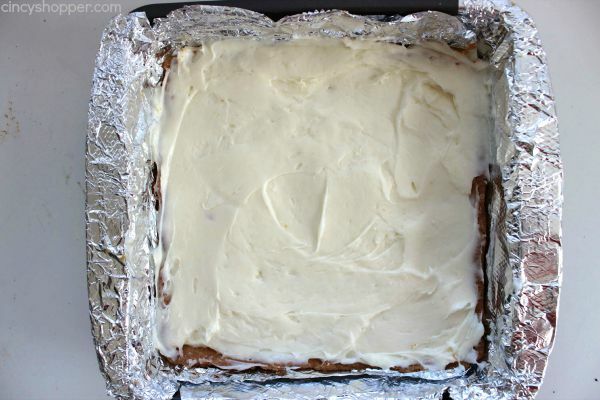 Press into bottom of prepared pan and bake 25 minutes or until lightly brown on edges. 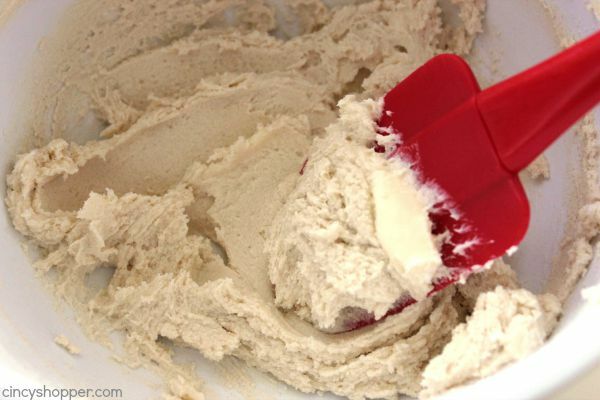 Beat together cream cheese and 1/2 cup sugar until well blended. Prepare homemade pumpkin pudding (and allow to cool) or combine pudding mix and milk and beat for 3 minutes until barely thickened. 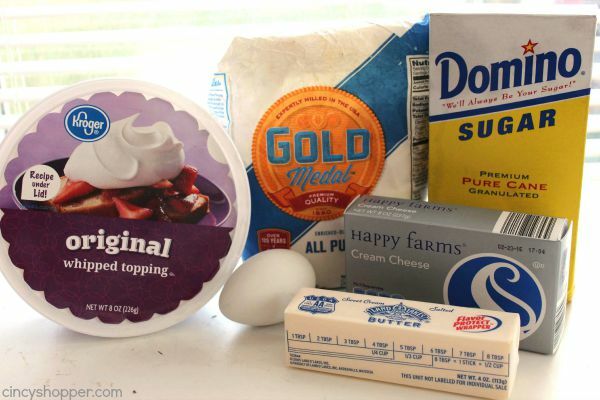 Spread pudding over the cream cheese. Remove from pan by lifting foil. 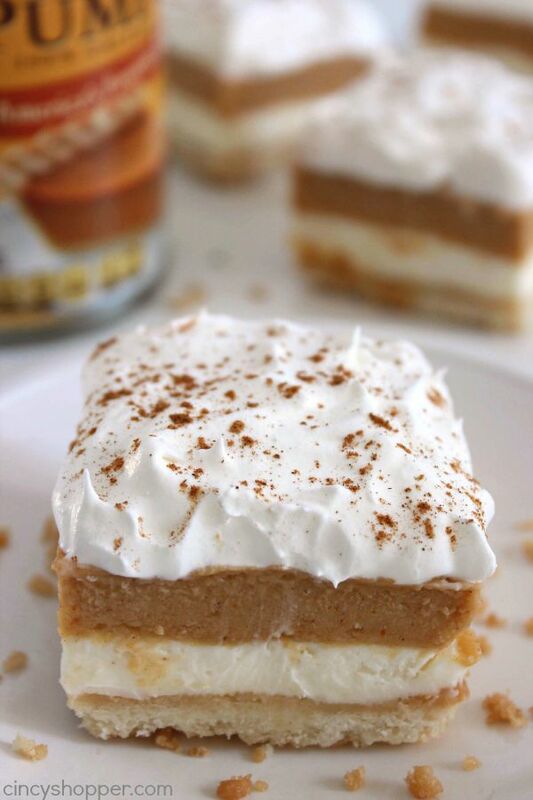 Spread whipped topping over bars. 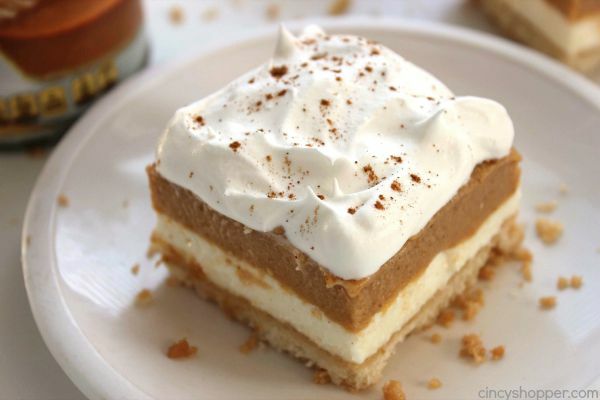 Do you have a favorite layered dessert you make frequently during the fall months? Line an 8x8" dish with aluminum foil. 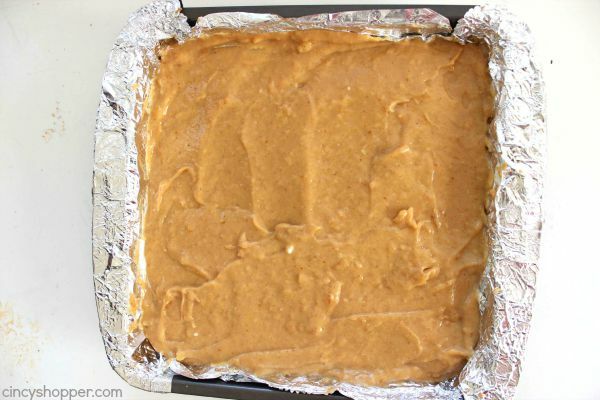 Prepare homemade pumpkin pudding or combine pudding mix and milk and beat for 3 minutes until barely thickened. Refrigerate until pudding is set. These look positvely decadent…and I love the homemade pudding option. Thanks for sharing! What is sprinkled on top of the whip cream? Holy moly. Everything you make looks so good, and these are no exception! I don’t even like pumpkin, but these are sooo gooood! I used the homemade pumpkin pudding recipe and they were amazing, Everyone loved them. I will definitely make these again. How long did you let them set before adding the whipped topping? I let mine sit over night but the pumpkin pudding was still not set. Still tasted amazing but not nearly as pretty! Mine didn’t set either , did you hear back from her? 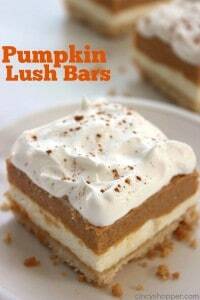 I just mad your pumpkin lush bars. Can they be frozen? Hi! 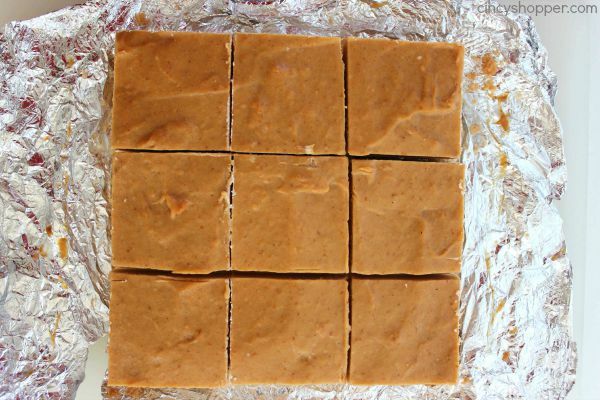 Just wanted to let you know you left out the egg in the ingredients, and adding to the flour, sugar & butter (Pumpkin Lush Bar) I knew something was off when I made this! Oh well, I’ll try again another day. What was sprinkled on the top. I am going to try this recipe at first opportunity, even if it isn’t the holidays. Why would anyone go to this much trouble, then put whipped hydrogenated oil on top instead of luscious cream? If I use the homemade pumpkin pudding, how much should I use? How much of the homemade pumpkin pudding would i have to use??? 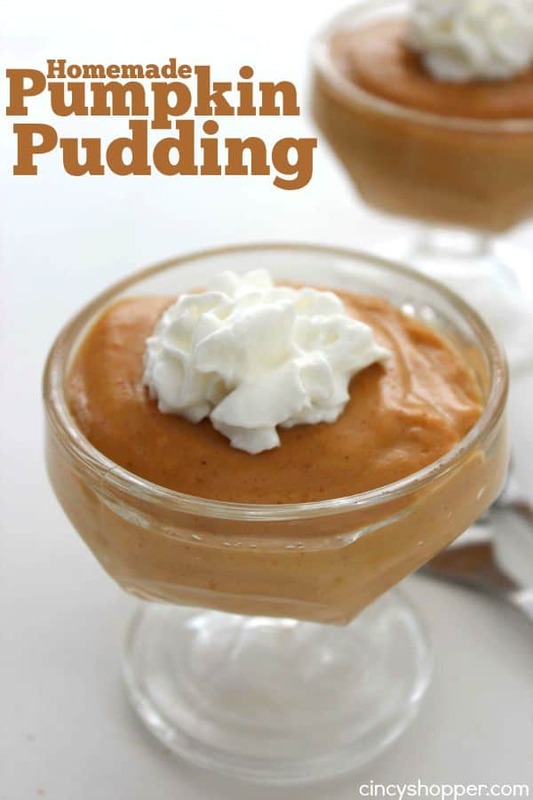 I could not find pumpkin pudding so used 1 lg vanilla pudding mix (bc I doubles the recipe to make a 9×13 dish & added 1/2 cup pumpkin puree and the spices she puts in her recipe for cooked pudding and used less milk–about 2 cups. turned out great! It looks like you never answer people’s questions but I will leave a comment anyways. I made this exactly as is, including the homemade pumpkin pudding, and it set up well in under an hour. I made my own topping with heavy whipping cream and sugar because really- who eats cool whip? ? 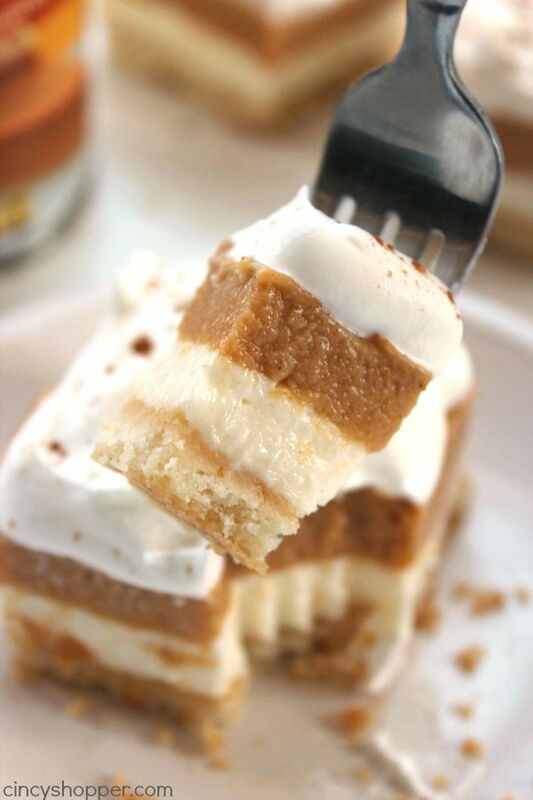 I think there needs to be more of a spicy bite to the pumpkin pudding and the cream cheese layer would taste better if it were actually cheesecake. It seems really heavy (even after beating it for several minutes) in comparison to the pudding and whipped cream layers. But it’s a good starter recipe and with a few tweaks it could be amazing. the ONLY place I have been able to find pumpkin pudding is at Walmart. Limited time, limited stock!